The most recent major volcanic eruption on Earth, Mount Pinatubo, in 1991, emitted about 20 megatons of sulphur dioxide into the atmosphere. This resulted in a temporary cooling of the planet by about 0.3–0.4 degrees during the two years that followed (photo: www.usgs.gov). However, if one looks at the past 10, 000 years, the period following the Last Ice Age, drivers of global climate were mainly natural factors such as changes in solar irradiance and volcanic activity. Influences from natural phenomena are both positive and negative, whereas the effects from CO2 are continually positive and accumulative year after year. The Sun is the source of all life on Earth, and it is an important factor in climate change. The total amount of solar irradiance in the uppermost atmosphere depends not only on how much energy the Sun emits at any given time, but also on the position and tilt of the Earth in relation to the Sun. Variations in the earth's position help to explain the long-lasting changes in temperature on Earth, such as those that occurred during the Ice Ages. Earth's path of orbit around the Sun is elliptical, but the eccentricity of the elliptical pattern varies in time cycles of 100, 000 and 400, 000 years. The tilt of Earth's axis in relation to the path of orbit varies in cycles of about 41, 000 years. This axial tilt is the reason why we have seasons on Earth. Earth functions like a spinning top, rotating completely on its own axis during the course of one day. The Earth's axis will never point towards the same direction at any given time. Instead it will slowly oscillate (precession). Due to this phenomenon, the date when the Earth is at perihelion (the point on the orbital path that places Earth closest to the Sun) changes over time in cycles of about 19, 000 and 24, 000 years. The current interglacial era has been subject to a number of changes in the orbital parameters. Some 6–7,000 years ago, a stronger tilt of the Earth's axis resulted in increased solar irradiance during the summer in the Northern Hemisphere, while the Tropics got less warmth from the Sun. At the same time, changes in the Earth's precession intensified seasonal variations in the north. These changes contributed to a sizeable rise in summer temperatures in the Northern Hemisphere, which in turn may explain why large glaciers in Norway, such as the Hardangerjøkulen and Folgefonna, were not present during this era. In the tropics it was generally colder, while monsoon rains were stronger than today. This may explain why the Sahara was a lush vegetated area at the time. The total solar irradiance varies over time and can be related to the well-known 11-year solar activity cycle. Higher sunspot activity yields increased solar irradiance towards Earth, and vice versa. Actual observations of sunspots on the sun's surface reveal that the last half of the 1600s were a period of abnormally little sunspot activity. Ever since that time and up until today, there has been steadily increasing sunspot activity. Direct measurements taken from satellites of solar irradiance have not indicated any clearly positive trends since 1978. This shows that changes in solar irradiance alone cannot explain current global warming. Volcanic eruptions are important for changes in weather and climate, particularly during the first couple years after an eruption. The most important effect volcano eruptions have on climate is due to emissions of sulphuric gases, which rapidly transform into aerosols. The aerosol haze reflects some of the incoming solar irradiance and thereby results in a cooling of the earth's surface. Volcanoes also emit steam and carbon dioxide, but because of the vast amounts that already exist in the atmosphere, even a major volcano eruption will not lead to a noticeable change in carbondioxide concentrations globally. However, on very long time scales (thousands to millions of years), emissions from many gigantic volcanoes may have increased the concentration of CO2 in the atmosphere enough to contribute to global warming. 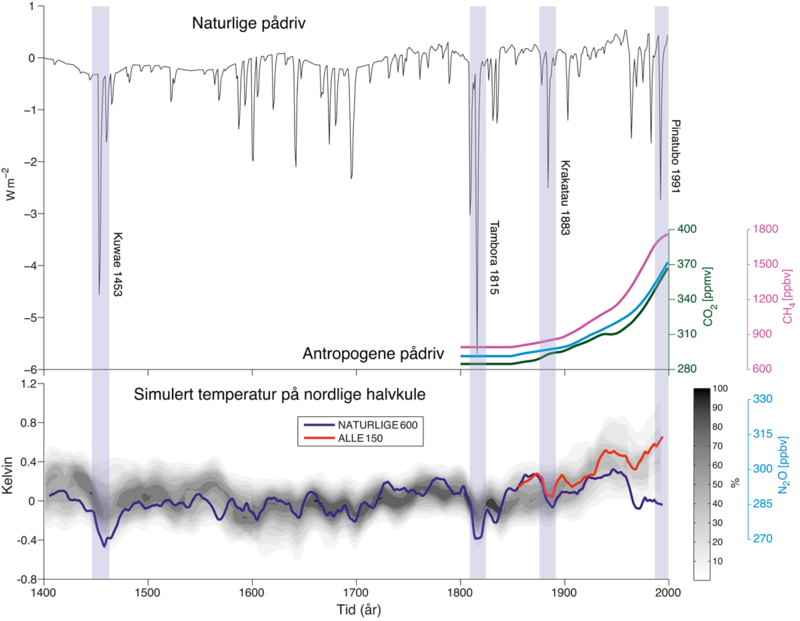 The Bjerknes Centre has used the Bergen climate model, including volcanic eruptions and variations in solar irradiance, to simulate the climate during the ’Little Ice Age’ (1400–1850 s). Natural factors largely explain the variations in both the reconstructed and the simulated temperatures in the Northern Hemisphere during this period (see Figure 1). The coldest periods during the "Little Ice Age" normally occur in periods with particularly violent eruptions, such as Kuwae in 1453 and Tambora in 1815, as well as in periods having a sequence of subsequent eruptions, such as during the 1600s. Figure1: Top: Natural and anthropogenic climate-change drivers. Anthropogenic drivers is the term for greenhouse-gas in the atmosphere as a result of emissions caused by human activity. Bottom: Simulated development of temperatures in the Northern Hemisphere over the past 600 years. The blue curve shows the simulated temperature when only natural drivers are applied in the model, while the red curve shows simulated temperature when all climate-change drivers are included. The shaded areas show the range of temperature reconstruction based on indirect data. Source: The Bjerknes Centre and IPCC 2007. Climate models can be applied using natural drivers, human-activity drivers and both at the same time. Figure 1 shows that it is only when researchers include both natural and human-activity drivers that the model is capable of simulating the long-term positive temperature trend that has been observed over the past hundred years (the red curve in the lower portion of the figure). According to the model, there should have been a decline in temperature in the Northern Hemisphere during recent decades if it had not been for emissions of greenhouse gases caused by human activity. This indicates that the observed warming primarily owes to emissions caused by human activity. On a short-term time scale, such as a period of a decade, the natural variations may outweigh human-caused climate change and result in some colder years, but in the longer term, human-caused warming will be the prevailing development. Atmosphere General Circulation Model, Adv. Atm. Sci., 25(2), 213–226. In 1920, Serbian researcher Milutin Milankovitch published precise calculations of the variations in Earth's position in relation to the Sun. Direct observations of sunspots on the sun's surface began around 1610 when the telescope was invented. To ascertain how solar activity has varied far back in time, researchers use indirect measurements of cosmic radionuclides from ice cores taken from the ice sheets covering Antarctica and Greenland. To reconstruct volcanic activity back in time, researchers look for coincidental peaks in sulphur concentrations in the ice cores taken from both polar areas and use these as indicators of points in time and strength of the volcanic eruptions. At the Bjerknes Centre research is being conducted to understand natural climate variations and the significance of external drivers such as the sun and volcanoes. Researchers are working to simulate climate scenarios spanning the past 20,000 years, and they are combining the modelling of ancient climates with an analysis of prehistoric data (for example, sediment cores from the ocean floor and from lakes) to gain an increased awareness of the important processes and feedback mechanisms in the climate system.